Two pubcasting fans in different cities who separately conceived plans for a “Million Muppet March” (later renamed Million Puppet March) in support of public broadcasting have teamed up to try to organize the event on Nov. 3 on the National Mall in Washington, D.C.
Michael Bellavia, 42, of Los Angeles, and Chris Mecham, 46, of Boise, Idaho, were watching the presidential debate on Oct. 3 when Republican nominee Mitt Romney said that he would end subsidies to PBS if elected. Even before the debate ended, Bellavia had secured the URL millionmuppetmarch.com, and Mecham created the Million Muppet March Facebook page. “We just merged the two into one effort,” said Bellavia, president of Animax Entertainment, an animation production studio in Los Angeles. Bellavia said Animax created the “Elmo’s Potty Time” game for Sesame Workshop in 2006. As of midday Wednesday, the Facebook page had more than 11,000 “Likes.” Some 415 people indicated on the event page that they planned to go, with 151 more listed as possible attendees. Bellavia said he invited PBS and Sesame Workshop to join the campaign, but each declined due to the political nature of the controversy. “We’d love it if all the people who work there could participate in some manner,” he said. Mecham is pursuing a political science degree at Boise State University. Neither of the two have event-planning experience. They’re in contact with the National Park Service to find out how to proceed. The march has so far received some high-profile media attention, with mentions on HuffPost Live, NPR, CNN, TV Guide and the National Review. 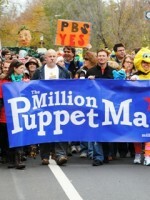 Some 1,000 marchers gathered on Nov. 3 on Capitol Hill to celebrate the power of public television. Sesame Workshop will continue on. However, the gov’t doesn’t subsidize Sesame Street–it helps PBS. Though Big Bird might still have a show, he needs stations to air it on! If funding for PBS is cut many children won’t ever get the chance to SEE Big Bird! “What most people don’t realize is that if federal funding for PBS were cut, much of the loss would be on the local level. Neither of the two have event planning experience. Really? Better check that out, Dru. for not having any event planning experience (and having never been in DC prior to the event) I think we did pretty well.